About five or six years ago, Games Workshop became much more lenient with the licensing of their venerable Warhammer 40,000 intellectual property. The company once guarded the franchise with a level of fanaticism almost comparable to the fervor of the Astartes that populate their grimdark world, making video game adaptations a relatively rare occasion. When THQ dissolved and Relic Entertainment was acquired by Sega, that slowly began to change. While things have drastically improved over the last few years, we do still get some pretty underwhelming 40k titles. I won’t single any games out, but 40k fans know exactly which ones I’m talking about. Luckily, we also get some really solid games from smaller studios that probably would have never been made in the past. Mechanicus is one example of such a game. As with most 40k games, the core story of Mechanicus is fairly straightforward. You control an Adeptus Mechanicus detachment under the command of Magos Dominus Faustinius that has launched an expedition to Silva Tenebris, a Necron tomb world that was discovered by another Mechanicus unit that didn’t leave the planet alive. Worse still, the meddling of the previous Mechanicus expedition has caused the Necrons of Silva Tenebris to begin to awaken. 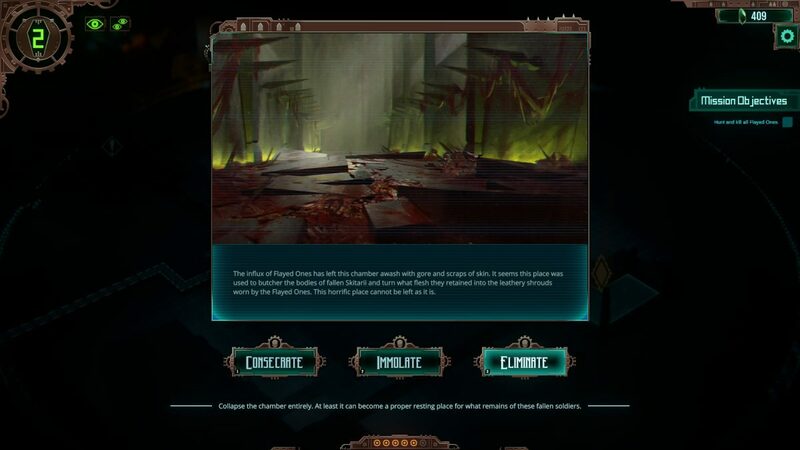 Your goal is to explore the tombs of Silva Tenebris, gather information on the Necrons, and ultimately find and destroy their leaders before the entire tomb world fully awakens. 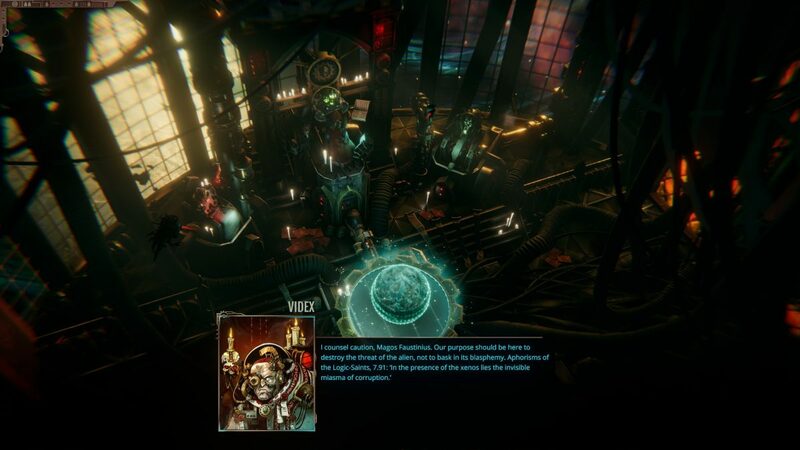 I was expecting little more than a solid turn-based strategy game from Mechanicus, but I was also treated to some fantastic writing that really nails the philosophy and feel of the enigmatic servants of the Omnissiah. The writing in the game was done by Ben Counter, a well known Black Library author that is responsible for some critically acclaimed 40k novels, and he brings a level of lore knowledge that many video game adaptations of the franchise lack. The tech-priests of the Mechanicus are in charge of keeping the secrets of the Imperium’s most advanced technology, and their religious devotion to the Omnissiah causes them to strive to replace their humanity with the strength and certainty of the machine. The characters you will be receiving orders from are nearly as distant and alien as the Necrons they send you to fight against, and this is reflected in the game’s excellently written dialog. Faustinius is one of the rare Magos Domini that realizes the importance of keeping some semblance of humanity on the path to becoming closer to the Machine God, but even he is calculating and pragmatic. The most extreme case is Scaevola, a character that is so heavily augmented that she is more of a breathing computer than a human. She talks in a pseudo-programming language, and her obsession with studying the Necrons and their technology to expand the Imperium’s collective knowledge banks completely overrides any concern she has for the Skitarii she callously sends into battle. After a brief tutorial, you are given access to the bridge of the Caestus Metalican, the Mechanicus vessel that your detachment operates from. From here you can accept missions from the various characters, as well as customize your tech-priests and read up about the various troops and unlocks you have acquired. 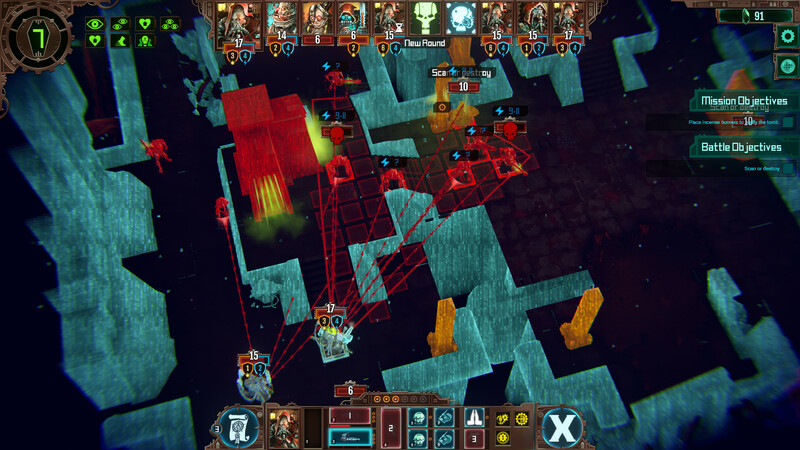 Mechanicus is often described as being similar to XCOM, but that’s only accurate to a fairly limited degree. You won’t be doing any research or base upgrades like in XCOM; the only thing to customize or upgrade are your tech-priests. While tech-priests aren’t the only troops you will be deploying, they are by far the most powerful and useful, and once you get to the mid-game, they will be doing almost all the heavy lifting. Each tech-priest can be equipped with a wide range of gear and weapons that you’ll unlock by completing missions. These gear slots include head, torso, arms, legs, two backpack slots, two tendrils, two ranged weapons, a melee weapon, and their Servo-Skull. Each piece of gear has an augment cost, and tech-priests can acquire more augment slots by being upgraded with Blackstone Shards, the game’s main currency. Upgrading a tech-priest involves purchasing skills from one of six disciplines, each of which are geared towards a certain playstyle. Each discipline contains five skills, and between each skill you can acquire pieces of armor that can be equipped to increase the tech-priest’s max HP, resistances, and some stats. You can freely mix-and-match the disciplines when upgrading your tech-priests, and there’s definitely some min-maxing potential in doing so. Once you have your tech-priests outfitted, its time to take on a mission. Before accepting a mission you’ll get an overview of what types of enemies to expect, your rewards, and a chance to choose which troops and Canticles to bring. As I said before, your tech-priests are your primary workhorses, but there are lesser troops you can bring like Skitarii Rangers, Servitors, Kastelans, and more. Servitors are little more than meat shields and should be used as such, but the others cost resources to field, so you’ll want to be a bit more conservative with them. Ultimately though, just like Scaevola, you will come to view all non tech-priest units as fairly expendable. You are refunded some of your Blackstone Shards if they survive the battle, but the monetary cost is only really a factor early-game; by mid-game you are getting enough Shards in each mission that the costs to field units become fairly negligible. At the start of the game you can only bring 6 units into a mission at once, but you’ll unlock more slots as the campaign progresses. The Canticles of the Omnissiah are a mechanic that resembles Stratagems from the current version of the tabletop game. You can bring 3 Canticles into a mission, and these act as special abilities that you can spend during combat to gain massive boosts, like increasing the damage of the next attack, causing the next several attacks to ignore armor, healing a unit, and more. Each Canticle can only be used once per mission, but they are reusable between missions, so there’s no need to try and horde them. 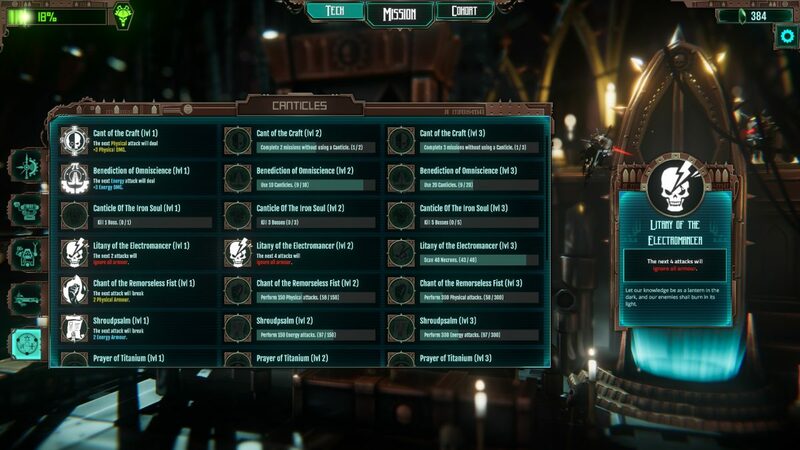 You gain more Canticles by hitting certain milestones in the game, like completing X number of missions, killing X number of Necrons, etc. There’s a huge variety of them, but as time goes on, you’ll eventually unlock versions that are straight upgrades of previous Canticles. That’s not to say that the previous version becomes totally obsolete though, since you could always choose to bring those along with the stronger ones to double up on a specific type of effect. Once you land, you are presented with a holographic interface, called the noosphere. This view represents Faustinius and his inner circle directing the mission from the bridge of the Caestus Metalican. Levels consist of a randomly arranged set of rooms, each of which contain some sort of encounter. The layouts of each level are randomized, but the events you encounter are always the same. Each event presents you with some sort of situation that needs to be overcome. Maybe you stumble upon a dying Skitarii, or a mysterious Necron console. You are then given three choices with set outcomes that you won’t know until you make a choice. In most encounters, two of these outcomes are bad, and the third might give you resources or an item. Sometimes the bad choices are pretty obvious, but in many cases it will come down to total blind luck if you pick the right choice. 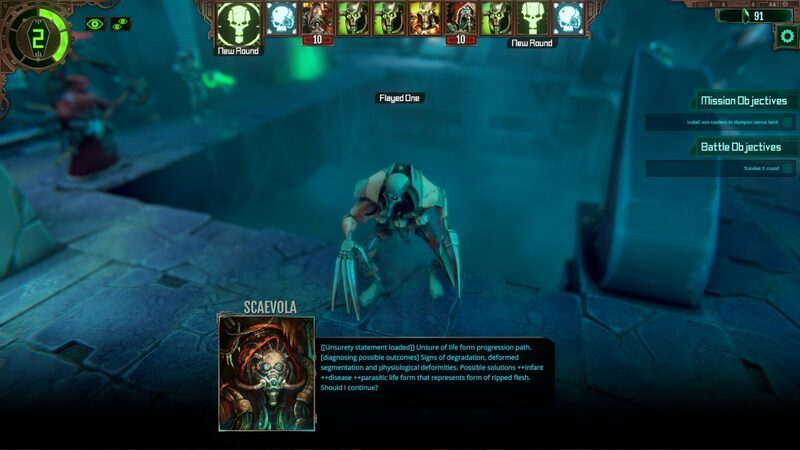 The penalties normally come in the form of the Necrons increasing their Awakening Level or getting a boost to their initiative in the next battle. The Awakening Level is essentially a timer. The longer you explore a tomb, the higher the Awakening Level raises and the harder the fights will become. The Awakening Level also has longer lasting effects than just the mission you are currently on. 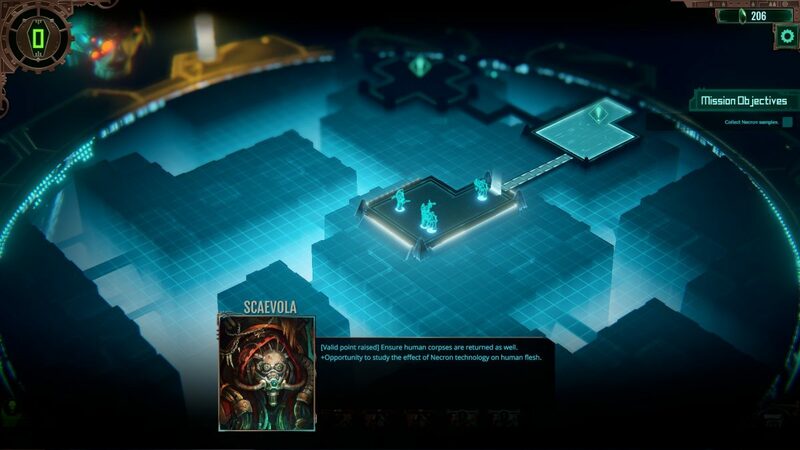 The amount of Awakening Level you reached in the mission is added to the overall Awakening Level of the Necron tombs of Silva Tenebris, which in turn pushes you closer to the final confrontation. Another possible encounter includes Necron Glyphs. In these situations, you’ll be presented with two or three Glyphs, and upon clicking one, something will happen. These could be good things like regaining HP, resources, or reducing Necron Awakening levels and initiative. Like the other encounters, many of the Glyphs are bad, but unlike standard encounters you will gradually learn what each Glyph does via experimentation, allowing you to essentially learn some of the Necron language. 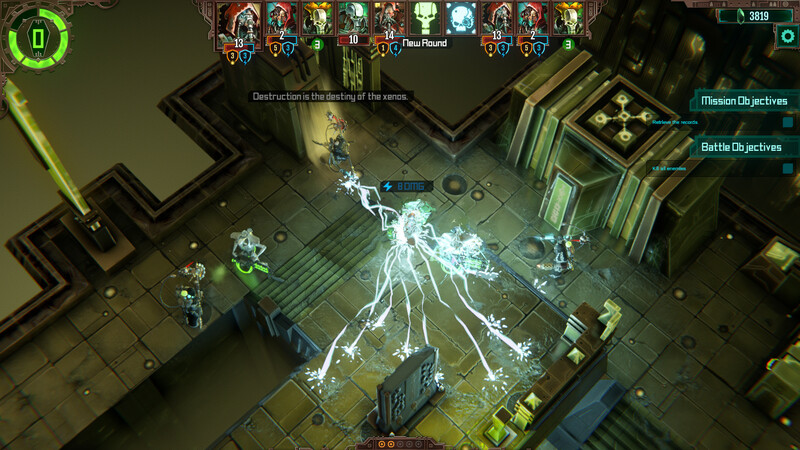 The final form of encounter is the combat, the thing you ultimately bought Mechanicus to experience. The combat comes in the form of turn-based battles where unit initiative is based on the level of Awakening you reached prior to the encounter. 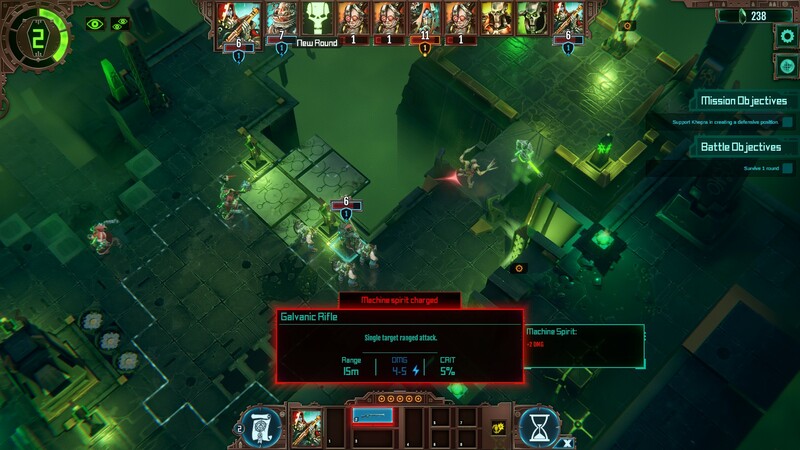 It’s popular to compare every turn-based strategy game to XCOM these days, and in Mechanicus‘ case, that isn’t a very accurate comparison. For one thing, there is no RNG here outside of crits, dodges, and the slight damage variance each weapon has (A gun might do between 2-4 damage by default, for example). If you shoot at something, it will hit. Some units and abilities might have a dodge chance, but by default, every shot will land where you want it to. This also means that there is no cover bonus in Mechanicus; you have to rely on outright blocking line of sight. 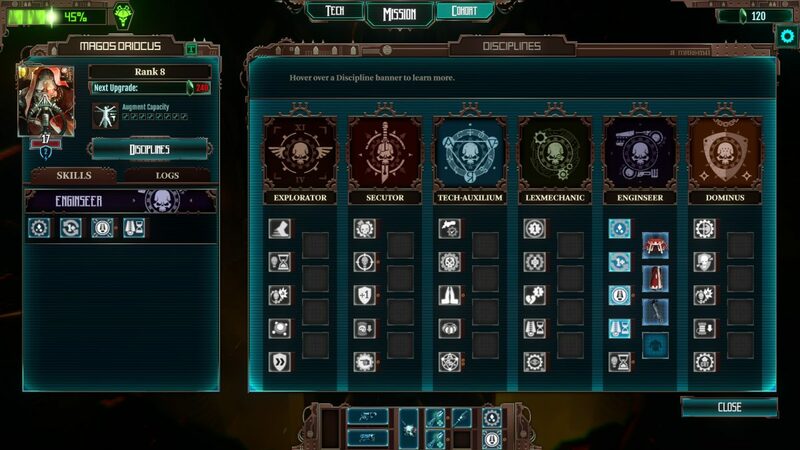 The other huge difference between Mechanicus and your typical XCOM-like is the Cognition Points system. 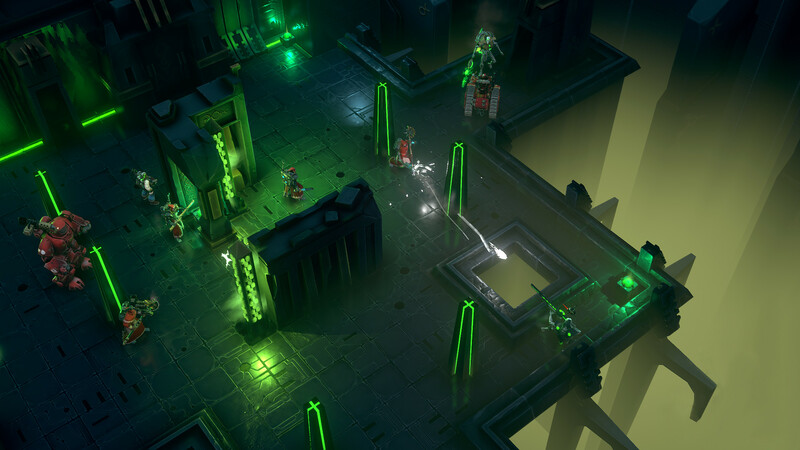 These points are a shared resource between your whole squad, and are used to fire some of the stronger weapons, activate special abilities, get extra movement out of your tech-priests, and call in units. When deploying units before a battle, only your tech-priests are free; everything else costs CP. If you are low on CP going into a mission then it’s not a huge deal, there are plenty of ways to gain it and you’ll have a chance to deploy additional units at the start of every round. The most straightforward way to gain Cognition Points is to have your tech-priests interact with structures that generate this vital resource. All you have to do is have a tech-priest walk near one. Alternatively, you can send out a Servo-Skull to gather the CP from a distance. Many events and Glyphs also offer CP as a one of the potential positive effects. The Lexmechanic Discipline is geared towards CP generation, so tech-priests that take this path will help you gather CP during a battle. The final major way to gain CP is by killing Necrons, or fielding Servitors, which generate CP every time they are hit by enemy attacks. 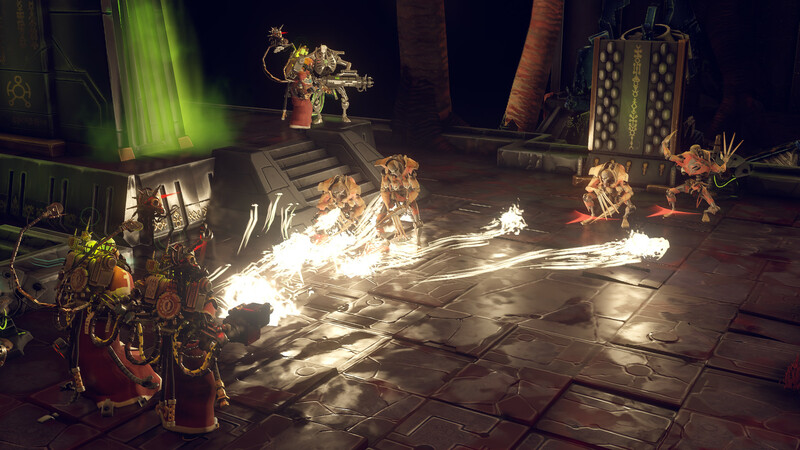 Servitors truly do exist just to block bullets, or in the case of this game, streams of green lightning-like energy that disassemble the target on a molecular level. You’ll probably struggle with the Cognition Point system during your first few missions because it never seems like you have enough of it. This ceases to be an issue once you hit mid-game and gain more varied ways to gather CP during battle. Learning proper CP management is vital to mastering the combat in Mechanicus. All of your most powerful weapons require CP to fire, as do many of the awesome support gadgets you’ll gather throughout the game. You can also spend CP to move your tech-priests additional spaces and even multiple times, allowing you to make aggressive plays before moving them back into a safe position. Fittingly enough considering you play as the Adeptus Mechanicus, knowledge is another core concept in the game’s battle system. Faustinius even brings this up at one point, and it’s far from a throwaway line of dialog. 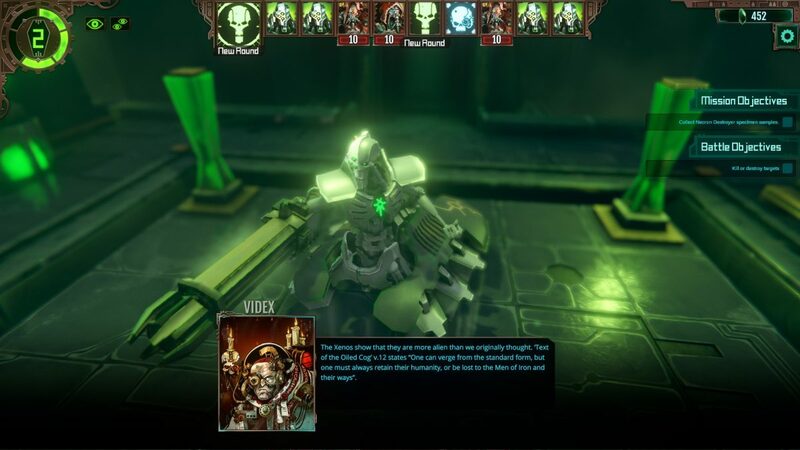 Learning the tactics, strengths, and weaknesses of the different Necron troops isn’t enough, you’ll also need to learn their health bars and resistances in each encounter. This information is hidden by default, and to learn it you’ll need to deploy your Servo-Skulls or use certain weapons or special abilities. A lowly Necron Warrior might have 3 physical armor, requiring you to resort to using energy weapons to dispatch them. These are things you’ll need to find out quickly before wasting precious unit activations and CP using the wrong weapons against a target. Another mechanic you’ll need to work your tactics around is the Machine Spirit. Each weapon has one, and using them will activate that Machine Spirit. This is basically an overcharged shot that does extra damage and possibly comes with a special effect. Obviously you don’t want to waste these shots, so you’ll need to learn how to juggle multiple weapons. Your Necron adversaries have a few tricks you’ll need to fight around too. Every map is covered in Necron sarcophagi, each of which are potentially capable of opening up at any moment to reveal a fully functioning enemy warrior. As 40k players are well aware of, Necrons also have a little thing called the Reanimation Protocol. In laymen’s terms, a Necron isn’t dead just because you shot it until it stopped moving. After a few turns, a Necron will reawaken and continuing fighting unless you shoot it again once it has fallen. Depending on your Awakening level, this could happen sooner rather than later. Critical hits override the Reanimation Protocol however, so investing in higher crit chances isn’t a bad idea. 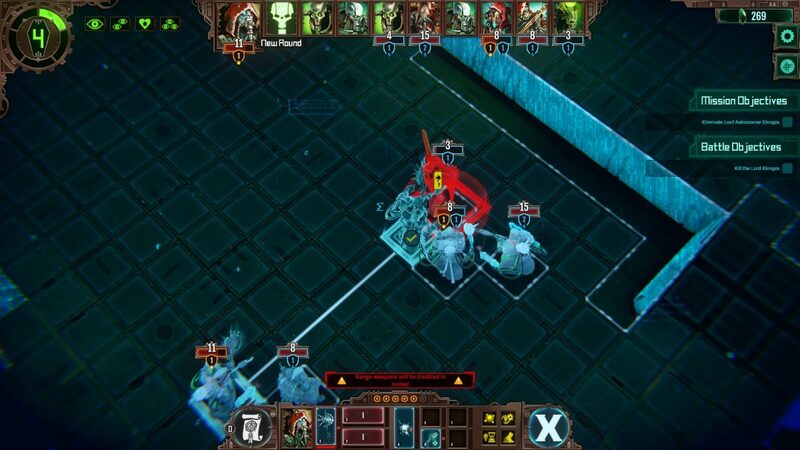 The combat in Mechanicus is satisfying and full of strategic decisions to make. There’s a great variety of weapons and gadgets to find and equip, and there’s lots of min-maxing potential if you are into that. Unit and enemy variety is also really solid. A decent chunk of the Mechanicus arsenal is represented, including Rangers, Kataphrons, and Kastelans. I’m also just really happy to see a 40k game that doesn’t focus on the usual suspects, like Space Marines or Chaos. From a presentation standpoint, the game looks and sounds great. It’s a very atmospheric title, and does a good job portraying two of the more mysterious factions in the setting. I already mentioned how great the writing is, but the voice acting and sound is pretty solid too. The Mechanicus tech-priests “talk” in a series of computer-like beeps and blops, but the Necron Lords are suitably insane, overdone, and egomaniacal. 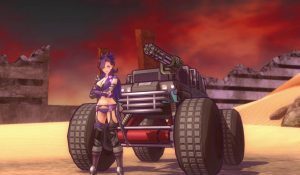 There’s quite a lot of obvious clipping, which are especially noticeable during the boss cutscenes, but the game’s graphics and animation are about what you’d expect from a mid-tier title like this. They don’t excel, but they are good enough that I have no real complaints. There’s also some performance issues, including frame drops and stuttering. Ultimately, since Mechanicus is a turn-based game, these issues are only minor annoyances. I’m pretty indifferent to the music, however. It’s mostly a fairly generic techno/electronic soundtrack when it comes to the battle music, and it just sort of blends into the background. While I do love Mechanicus, I must admit that it has a few major flaws holding it back. In the minor problems department, there’s a few UI quirks here and there. For example, you can’t just drag and drop a new item into an existing slot in the tech-priest menu. You have to manually unequip an item in a slot before you can drag the new item in. During events you also occasionally see a consequence of your decision clip into the text box describing the outcome. A few weapons also sometimes list the wrong damage types, but the recent patches have been slowly squashing those bugs. 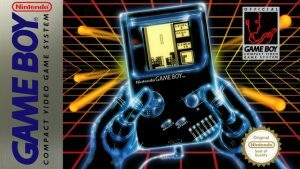 The two most glaring issues, however, are the difficulty and replayability. 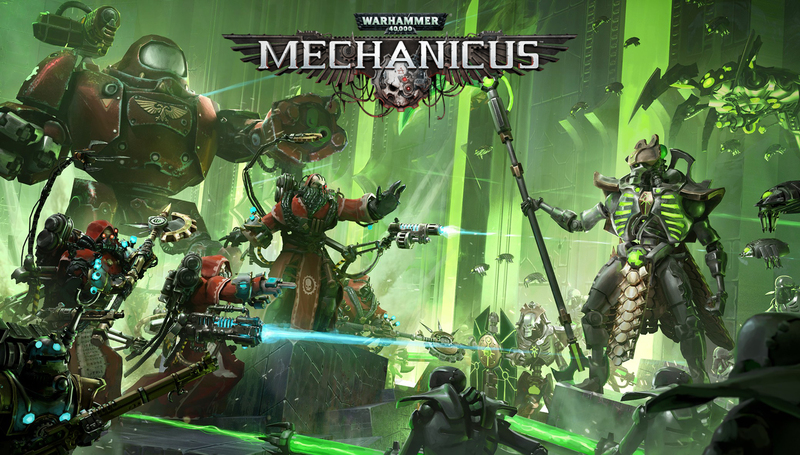 If you have a decent amount of experience with turn-based tactics games (which isn’t exactly a stretch considering this is a 40k game) then you’ll probably breeze through Mechanicus in about 15 hours. And when I say breeze, I mean that the game gets really easy once you hit the mid-game. 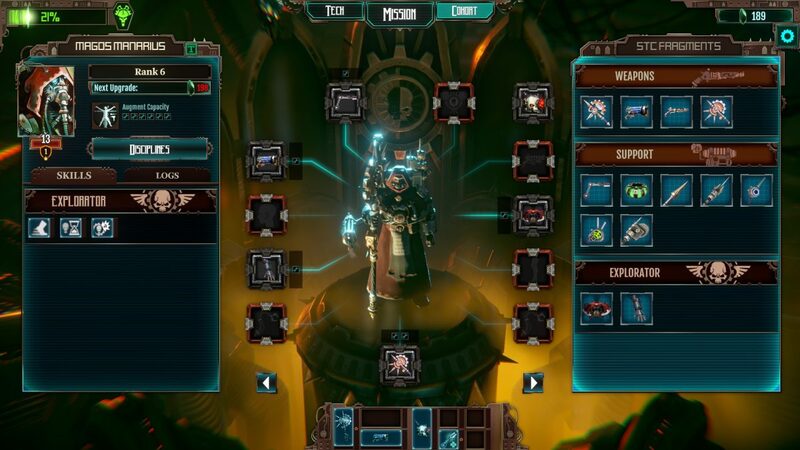 Your first few missions will be a bit stressful, but once you start getting fully outfitted and upgraded tech-priests, the game begins to lose its challenge. This could possibly be fixed by taking another look at the overall balance of some of the weapons and gear, especially when it comes to the heavier AOE weapons. Not even the CP and Blackstone Shard cost of deploying units is much of an issue later in the game because you are getting so much money each mission. You have to intentionally play inefficiently by ignoring your AOE weapons and taking the long routes to raise your Awakening level to run into any real problems. Your tech-priests become a bit too overpowered once you have some decent gear and ranks. You’ll also see the same maps repeated fairly often, so there isn’t a ton of variety in layouts and mission objectives. On another minor complaint note, there isn’t much variety to visually customize your tech-priests, so after a while they begin to start looking very similar to each other at a glance. The other issue is that there isn’t really much reason to play multiple times unless you just really enjoy the gameplay loop. 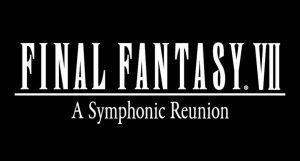 There’s multiple endings and a limited amount of randomization in the missions, but the game lacks any sort of meaningful post-campaign content like an endless mode or new game plus. Once you beat the game then that’s basically it. The game doesn’t even have multiple difficulty settings. There is more content on the way, however. If you click the noosphere while in the mission hub you’ll find a cryptic message with a date: December 10th. What this means is anyone’s guess, and it will likely remain a mystery for the next few weeks. Complaints aside, I still had a lot of fun with Mechanicus. The core combat mechanics are great, and there’s a lot of variety in how you build your tech-priests. I just really wish the game was more challenging, and that there was more content to keep you playing after reaching the end. As it stands, Mechanicus is a really good 40k video game that comes just short of being a truly great one. With a bit more tweaking, we could be looking at a 40k title that would be up there with the original Dawn of War in terms of how fondly it is revered by fans of the IP. 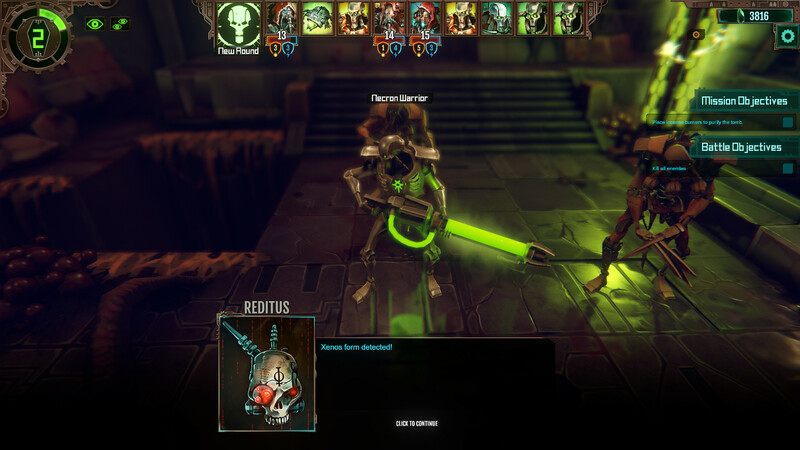 Warhammer 40,000: Mechanicus was reviewed on Windows PC using a review copy provided by Kasedo Games. You can find additional information about Niche Gamer’s reviews/ethics policy here.